Set up to offer views of Waterfalls by Olafur Eliasson, Brooklyn Bridge's Pier One pop-up park last summer had tacos (really good ones) and beer to spare. If eating tacos and drinking beer outside in Dumbo is key to a successful summer, you might want to modify your expectations. The gods of summer may not have this in mind for 2009. A trip to Brooklyn Bridge Park this sunny weekend turned out to be disappointing for those looking for more than just grass, sunshine and hundreds and hundreds of screaming children. 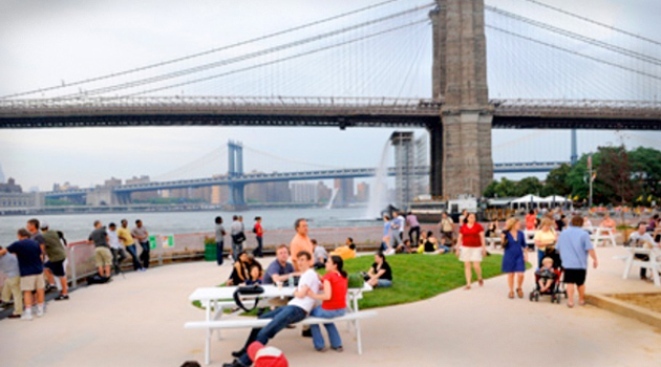 Last year, the Pier One “pop-up park” offered basic Mexican fare and beer on tap from a local restaurant, which was enjoyed in the spray from the The New York City Waterfalls exhibit. This year, the waterfall, of course, was gone, and so was the park and with it the killer tacos. And with that, the beer. No striped umbrellas. No picnic tables. Only dirt and fences and cranes. Pier One is under construction as part of a larger plan to expand the Brooklyn Bridge Park, and is scheduled to open next summer. The plan includes 9.5 acres of green space, granite steps salvaged from the Roosevelt Island Bridge, a waterfront promenade and a playground for the kiddies, (but, alas no mention of tacos). But that’s okay, because Pedro’s is just a block away, right? Oh think again, you silly mortal. Pedro’s has lost its outdoor seating license and won’t get it back for at least 120 days (just in time for the leaves to fall).